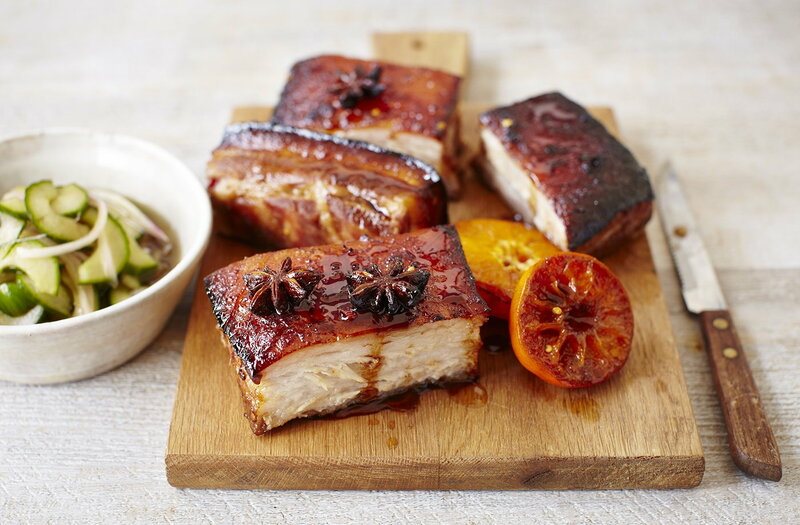 This stunning roast pork belly dish is made with a soy, star anise and clementine marinade, giving it an aromatic oriental twist. Serve with a quick homemade pickled cucumber dip and all the usual trimmings for a delectable alternative Sunday roast. In a sealable plastic container combine the ginger, garlic cloves, star anise, soy sauce, fish sauce, lime juice, clementine juice, sugar and chilli. Put the pork, skin-side up, in the marinade, cover and then refrigerate for up to 12 hours. For the pickled cucumber, mix the lime juice, fish sauce, rice vinegar and sugar in a bowl and stir until the sugar has dissolved. Season to taste. Add the cucumber and shallots, stir and refrigerate until required, at least 30 minutes. The pickle can be made several hours ahead and kept for up to 3 days. Preheat the oven to gas 4,180°C, fan 160°C. Put the pork, skin-side-up, the marinade and 100ml (4fl oz) of cold water in a baking tray. Drizzle the pork with the vegetable oil, season and put in the oven. After an hour, remove from the oven and baste with the juices. Then continue to cook for a further 1 1/2 hrs, basting every 20 minutes. Half an hour before the end of the cooking time, add the halved clementines to the baking tray. Once cooked, remove the pork from the pan and allow to rest for 20 minutes. Serve the pork with the warm pan juices, cooked clementines and pickled cucumbers.